Situated in the city, Town in Town Hotel Bangkok is a 5-minute walk to Town in Town Park and The Scene. It features an outdoor swimming pool and a 24-hour front desk and room service. Free WiFi access in all areas. The hotel is a 30-minute drive from Suvarnabhumi Airport and Ramkhamhaeng University is a 20-minute ride away. Spacious and air-conditioned rooms are equipped with a flat-screen TV with cable channels, safe, seating area, wardrobe, fridge and minibar. Shower facilities are included in an en suite bathroom. The hotel provides a business centre, exchange counter and parking. A relaxing massage can be enjoyed. A selection of Thai food is available at The Pavilion Restaurant. 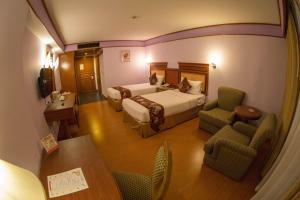 Spacious and air-conditioned room is equipped with a flat-screen TV with cable channels, a seating area and a wardrobe. A fridge and a minibar. A bathtub and a shower are included in an en suite bathroom. The property offers hot shower facilities in each floor. Rate: THB 1500.00 ... THB 1700.00; select dates below to get current rates. More luxurious, spacious and air-conditioned room is equipped with LCD flat-screen TV with cable channels, a seating area and a wardrobe. A fridge, a minibar and slippers are offered . Shower facilities are included in an en suite bathroom. Tea and coffee are available.